Few leagues across Europe are as youth friendly as the Spanish La Liga which seems to have a never ending stream of fascinating younsters coming through the league, from Messi to Asensio and now these blooming aces. Another striker off the Real Madrid production line, described as an unapologetic scavenger. He could very well take the place of another former academy graduate Alvaro Morata who recently jetted off to Chelsea. 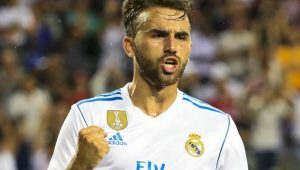 If Real leave off signing another centre forward, Mayoral would be the obvious choice to lead the line whenever Zizou decides to rotate his team. He will be looking to put his less than successful loan spell at Wolfsburg in 2016/2017 season behind him, where he made just 3 starts. On the bright side, he scored in 2 of those. For more similarities with Alvaro, see jersey number. Turkish 20 year old Ünal was priced from Manchester City for €14m after his stellar season in the Eredivisie where he bagged 18 goals in 33 games for Twente, 3 behind top scorer Nicolai Jorgensen. Already a Turkish international, Ünai will be keen to prove to the blue side of Manchester how much of an asset they have lost. 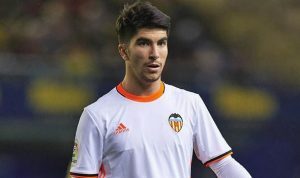 Exciting Valencia youngster Soler was given the opportunity to play last season due to injuries to Enzo Perez and then care taker coach Voro deciding that Mario Suarez was not up to scratch. The young midfielder took his chances and was very impressive and now with both players gone could cement his place in the starting XI. A versatile midfielder capable of taking on offensive and defensive duties, he is certainly one to keep an eye on. One person who already has an eye on him is Jose Mourinho, Mancunian interest in the youngster prompted a new contract with a buy out clause of €80m. Real signed Valverde from Penarol after the then 17-year-old came to the fore in the latter part of the Uruguayan Primera Division. He spent 2016/2017 with Real Madrid’s Castilla and in the summer was part of the Uruguay team that finished 4th at the 2017 u20 World Cup where he played all but 5 minutes of their cup run. It will be interesting to see where he plays while on loan with Deportibo having played first on the right wing for Penarol, he moved centrally for Castilla as an attacking midfielder but featured mainly as a defensive midfielder while with Uruguay youth team. Penaranda suffered an injury ravaged 2016/2017 season and was unable to deliver on the promise he has previously shown while on loan with Granada the previous season when he became the youngest non-Spaniard to score a La Liga brace a record previously held by a certain Lionel Messi. Despite being a full Venezuelan international, he took part in the 2017 U20 World Cup scoring 2 and laying on 3 more as Venezuela claimed 2nd place. The flamboyant forward originally on the books of Watford, but on loan at Malaga will be hard to miss with his brightly colored hairstyles. 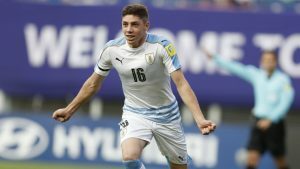 Celta have made an excellent bargain signing stealing 20-year-old Gomez from Defensor Sporting for a mere €4m after he blitzed the closing stages of the Uruguayan Primera division scoring 10 times and assisting 3 in 14 games. An overall record of 29 goals and 12 assists in 52 games for Defensor attests to the massive potential Maxi Gomez has. A powerful forward who is very good in the air, and has a mean right foot, he could make an instant impact at the club and would be a great option for when they struggle to break down teams as well as from set pieces. 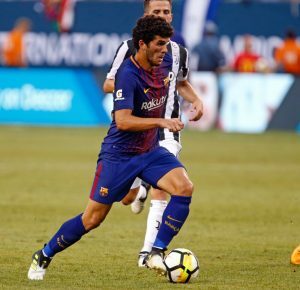 A list like this is hardly ever complete without a player from Barcelona’s famed academy and Aleña is the latest from the La Masia production line and has been on the brink of breaking into the first team. 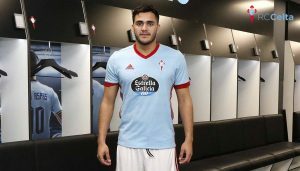 He was instrumental in the B team gaining promotion to the Segunda division and still managed a few cameo appearances for the main team and has been touted as a future star player for the club. Nobody under 20 had more assists than Oyarzabal’s 7 last season as the Lacey winger helped Real Sociedad to a 6th place finish. Expect 2017/2018 to be no different as Sociedad will be aiming to do just as well or even better and will be hoping for their boy wonder to put on another impressive showing and maybe add a few more goals to his tally. Already a key member of the U21 squad, he will be looking to impress Jules Lopetegui with the 2018 World Cup coming. After joining Real Madrid from Zaragoza he has spent the last 2 seasons on loan first with Zaragoza and then last season with Frankfurt. He was so good on loan last season that Real were willing to let Pepe go on a free transfer without signing anybody as a replacement. Vallejo’s strength and intelligence were key to his performances for Frankfurt and he never missed a single BuLi game he was fit for. His absence through injury was felt by Frankfurt as they won only one and lost 6 of the 9 games he was unavailable for, conceding 17 goals in the process, compared to 7 losses in the 22 he started. Manchester City have been gracious enough to loan out 5 of their players to Girona, and 4 of them are titillating young players. Pablo Maffeo 20 year old right back who was with Girona as they gained promotion from the Liga 123, Alex Garcia 20 year old gifted midfielder, Columbian 20 year old forward Marlo’s Moreno and 19 year old Brazilian Douglas Luis who cost the citizens €12m from Vasco da Gama. 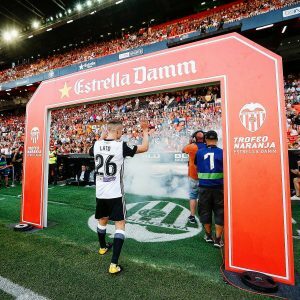 Some of the other whiz kids who will be on show include Malaga’s Javier Ontiveros 19, who sacored twice and assisted 3 more in 7 starts last season, Theo Hernandez(Real Madrid) and Toni Lato(Valencia) who are both 19 year old left backs, Theo was most impressive for Alaves as they finished 9th last season while Lato was an able back up when called upon for Valencia. Both may struggle to break into their first teams while competing with Marcelo and Jose Gaya respectively. Aaron Martin 20 at Villarreal, also a left back who could benefit from the departure of Jose Angel to stake a claim for a first XI place. Cristian Rivera 20 was used sparingly by Eibar last season but still managed to impress, losing only 2 of the 11 games he started in all competitions. 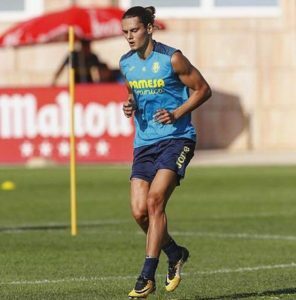 Aaron Caricol Espanyol’s 20 year old left back, 20 year old Betis Winger Matias Nahuel on loan from Villarreal and Real Sociedad!’s Igor Zubeldia 20, round up the almost unending list of La Liga fledglings to look out for in the 2017/2018 season.